Whether you need a one off repair for business continuity or an on-going maintenance programme, our team of qualified electrical engineers work around the clock to keep your business running smoothly, leaving you with peace of mind everything is taken care of. We make it our priority to keep businesses up and running 24/7, without any disruption. 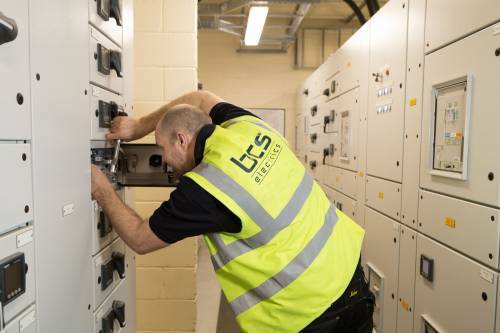 From the initial telephone call, the BCS Electrics team put in place a rapid response service for repairs, starting with a site inspection to identify the problem. Our electricians either repair immediately or find an alternative, temporary solution to keep the business fully operational at all times. The best way to avoid disruption is to talk to us about our electrical maintenance service. This way, we can keep on top of potential problems, find the defects that can lead to longer, often more expensive, issues. If you need help with electrical repairs or would like to talk to us about saving money through our maintenance service, talk to the BCS Electrics team on 0113 235 0400.